It’s 4:45 pm on a Tuesday afternoon, and a group of students from MATH022 wants to gather in in their favorite campus meeting room — but how do they know if the room is available? The conundrum has long been a familiar one on college campuses nationwide, no matter the major: shared spots are popular among high achievers hoping to collaborate, and it can be challenging to find spontaneous meeting places. 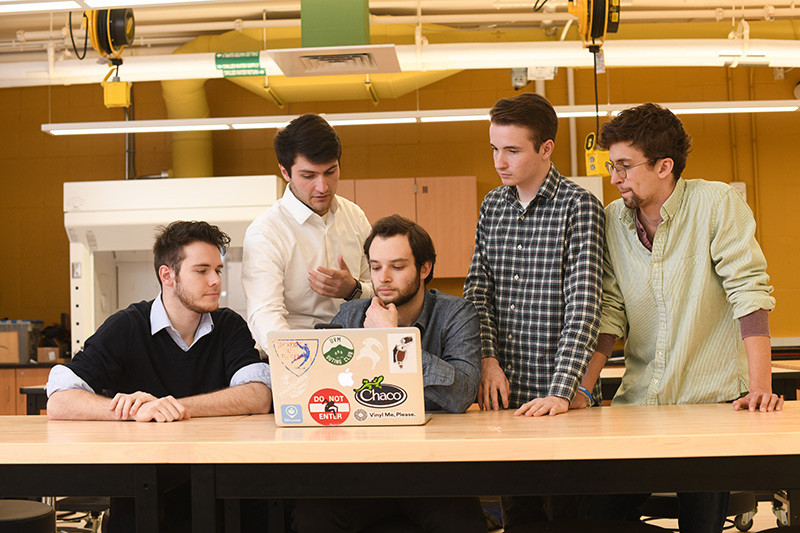 So last fall, Lippolis partnered with Dean Wertz ’19, who was taking an entrepreneurship class, to create Rhume, which also includes Edward Kreutzer, Griffin Georgiadis and Sean Kotch on its team; two financial analysts from the Catamount Innovation Fund are part of the project, too. Medical student Al Marchese ’19 established the Catamount Innovation Fund last year to allow grads and undergrads to connect with entrepreneurs, inventors and alumni. It’s a unique approach to collaboration in the fact that it’s a student-run program. Rhume has a three-pronged approach toward improving student productivity — not only finding and booking rooms, but also providing a phone-number-free platform for collaboration. “It takes the intimidation out of joining a study group,” says Lippolis. Currently, 150 UVM students are participating in the public beta-testing of Rhume, which has been available on Apple and Google Play since January and uses sensors to detect availability in Bailey Howe, Waterman and beyond. “The feedback has been overwhelmingly positive,” says Lippolis, who, with his partners, spends at least 20 hours per week refining the app. Though he originally intended Rhume to be a fun side project, its reception at UVM has convinced Lippolis that this has potential at any college campus in the U.S. More time to study and less time wandering around rooms? For CEMS-minded students, that’s a good thing.